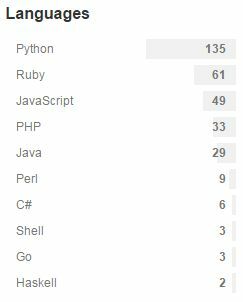 This 100 item list represents a search of github for “twitterbot”, Apr 2015.
prasannasp/twitterbot .. A twitter retweet bot script written in PHP. Searches twitter for hash tagged words, and retweets them. zilladotexe/TwitterBot .. Simple PHP Twitter Bot that responds to certain tweets. nirvanatikku/ga_twitterbot .. Google Analytics powered TwitterBot that lives on AppEngine. zwass/heroku-twitterbot-starter .. Starter kit for creating Twitter bots hosted for free on Heroku. Please do not use for evil. TotalFreedom/TwitterBot .. TwitterBot for TotalFreedom; handles twitter superadmin verification and notifies the owner when the server is offline. natzar/TwitterBot .. Just a Twitter Bot. You will need a cron job to run it periodically. Don’t abuse Twitter servers. jjulian/twitterbot .. A little wrapper to automatically tweet stuff. KalenWessel/TwitterBot .. A python application which searches for user specified hashtags. When a match is found, the application will try to follow the user of the tweet. yono/gae-twibot .. GAE/P ?????? TwitterBot ?? bkkerrigan/TwitterBot .. Interacts with twitter. Multiball/TwitterBot .. This repository hold code for an automating a twitter account using python, and some auxilliary files.